Hi everyone. We've mentioned this before, but it's funny how often a "thrifting theme" comes about when looking for goodies. This post, "Fishy Finds", basically wrote itself this past week. We have a predilection for marine and fish items, and pick them up whenever possible. This set of fish plates was actually thrifted from a long time ago, but we finally had a chance to take pictures of it this week. 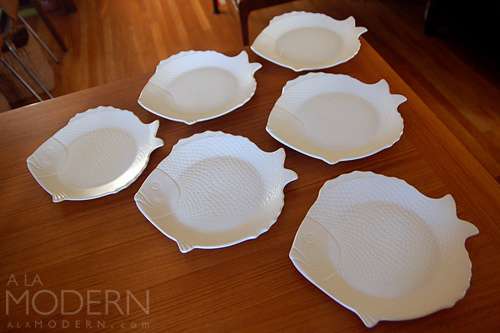 These are tuna plates commissioned by Chicken of the Sea from one of the California potteries in the 50s. Believe they were actually some sort of prize that you could send away for after collecting enough tuna labels. I've heard a couple of different stories about who made them - Bauer and Hollydale are often mentioned. 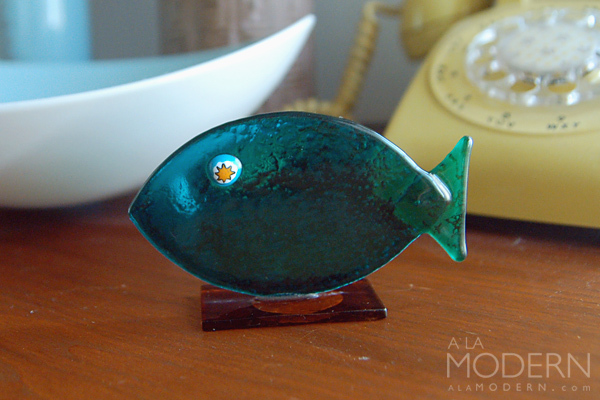 This little Italian glass fishy swam into our basket, even though he's a newer production. Made in Italy for a company called Exposures, he has a gold sticker on the bottom dating him to 1993. We're still learning the ropes for Italian items, but we'll thrift almost anything from Italy if it's reasonable. This wonderful illustration depicts cod fisherman from Norway - it's marked on the back with "Torskefiske" and that seems to translate to "cod fishing". 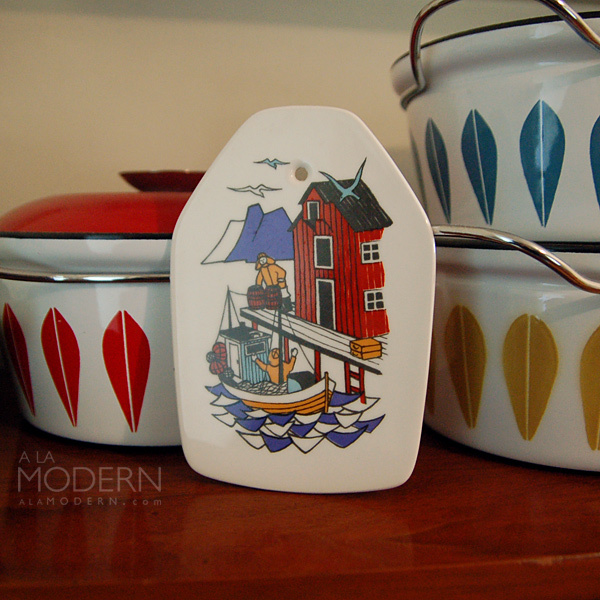 I know that Figgjo had quite a few designs on this shape of wall plaque, including a bunch by Turi Gramstad-Oliver. Ours says the design is by "Gerd", but I couldn't figure out who that artist referred to - if you know, please send me a mail about it! 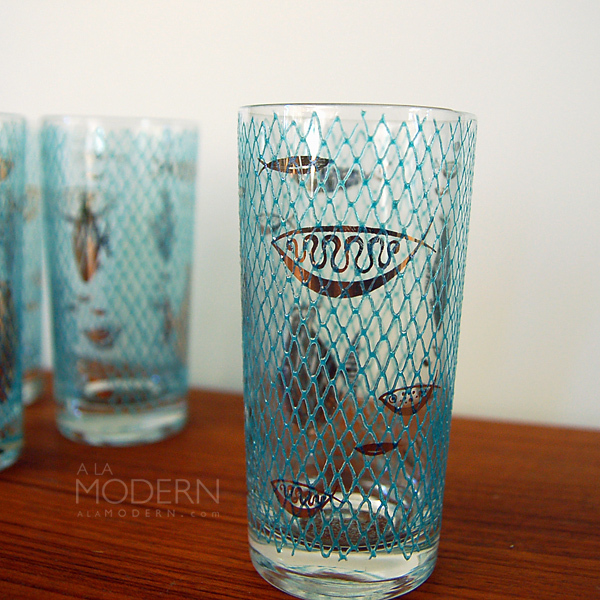 Lastly, I found these very unusual, kitschy midcentury fish glassses. We've seen gold leaf fish designs like these, but the weird blue-ish "netting" that seems to have captured them was new to us. It's a raised matte sort of material - we were also surprised that it was almost all intact. This was ONE occasion where the thrift store backroom workers failed at their usual job of devaluing vintage items! OK - hope to have the next TT post in our "How To Start A Reselling Business" series up on time this coming week. Happy thrifting!